This week marks the start of Lent and the first of our weekly Lenten menus. Like last year, we’ll be giving up desserts; beef and pork; junk food; and chicken and duck, or, as Kim puts it “No sweet, no meats, no snacks, no quacks.” It may seem like a lot, but we should point out that with the possible exception of chicken, we don’t eat a whole lot of any of the things on the list. It won’t be easy to give up any one thing, but we need a longish list for our plans to really constitute a sacrifice. 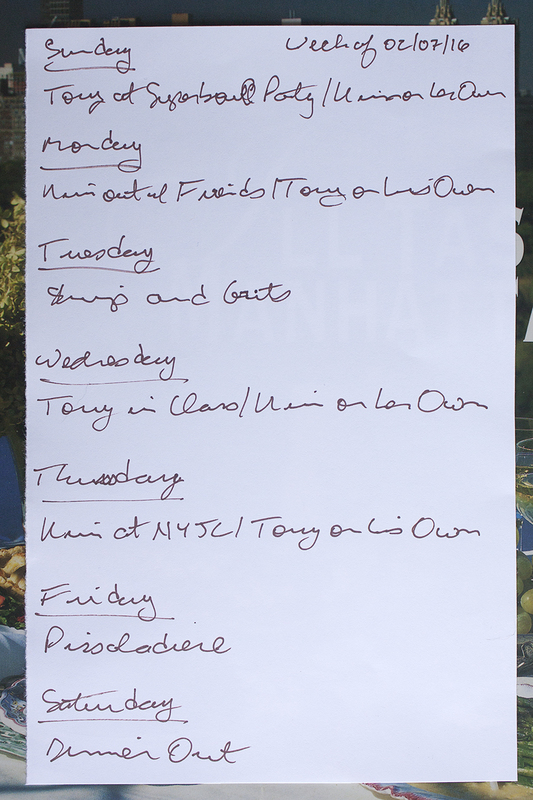 We have a busy week this week. Tony has plans Sunday (Super Bowl party) and Wednesday (Photoshop class) and Kim has plans Monday (dinner with a friend) and Thursday (a meeting at the New York Junior League). Plus, we’re seeing a play Saturday night and will have dinner out before the show. With only two dinners to make this week, we had to choose wisely and we think we did. On Tuesday night we’ll have our traditional Mardi Gras dinner: shrimp and grits. It may not seem like much of an indulgence for Fat Tuesday, but we really enjoy it. (Plus, we’ve been going a little heavier than usual on the meats and sweets this weekend, so we’re not totally deprived.) This year, we’re making Food & Wine’s Smoky Shrimp and Grits. The smokiness comes from paprika and we’re going to amp it up a bit by using smoked paprika instead of the hot paprika called for in the recipe. The grits feature a twist as well: they contain spinach. Not exactly a traditional Southern approach, but one we’re looking forward to trying it. The recipe uses a little white wine, so we figured we would have the same wine with dinner. Michael at Columbus Wine and Spirits picked out a 2104 Chateau Ste. Michelle Indians Wells Chardonnay. On Friday night, we’ll make something a little more involved: Ina Garten’s Pissaladiere, a type of pizza that originated in the south of France and that is topped with caramelized onions, garlic, and anchovies. Since the onions take so long to cook (about 45 minutes) we decided to save a little work and buy pre-made pizza dough. When the onions are done and the pizza goes in the oven, we will open a bottle of Louis Latour Bourgogne Aligote (also recommended by Michael) and have some while we wait and enjoy the rest with dinner.